This shop has been compensated by #CollectiveBias and its advertiser, Walmart Family Mobile. All opinions are mine alone. 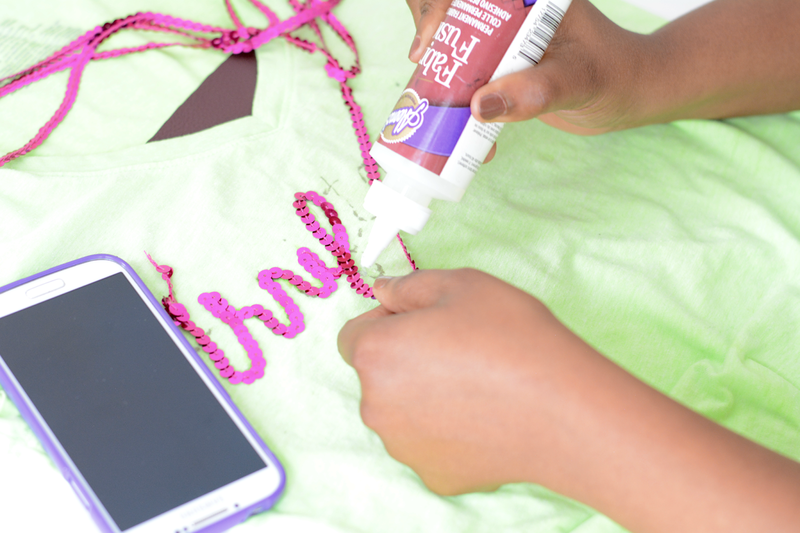 Having #MyDataMyWay means lots of audiobook downloads while working on diy projects. I'm currently reading Three Wishes by Liane Moriarty and covering up stains on a tee with magenta sequins. One of the great things about Walmart Family Mobile is the unlimited talk, text & data for the amazing price of $29.88/month. I use a lot of data throughout the day. My phone is with me at all times. Whether cleaning, cooking, crafting, or driving around running errands, I'm usually listening to a book. It's my favorite way to multitask. My go to apps for good reads are Overdrive, Hoopla, and Overdrive. I start my search with the free downloads first via Overdrive and Hoopla and then fall back on my Audible subscription if I can't find what I'm looking for. My current refashion came about due to my inability to keep food and drink from dribbling down a nice new t-shirt. I decided to cover the stains with sequins! Create a word stencil. I used PicMonkey's Thirsty Script Bold for the wide spaced cursive font. Cut around the letters to make the stencil. Place a piece of cardboard or fabric inside the shirt so marker and glue do not bleed through to the back of the shirt. Trace your word using the stencil as a guide. Apply sequin trim. Working with small sections, squeeze out a thin line of glue. 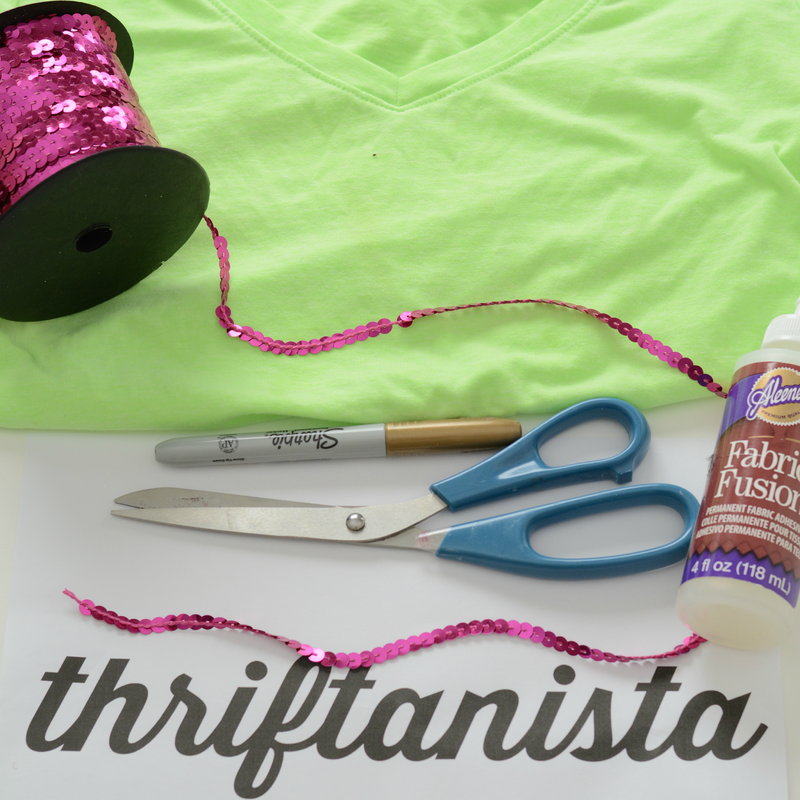 Lay the sequin trim on top of the glue. Go slow. Some letters will require a bit of maneuvering to shape the letters correctly. Allow to dry 24 hours. For extra support in the wash, you can add a few stitches to anchor the letters in place. All done. My stained shirt is new again and I also finished up the book I was listening to so it's time for another download. Walmart Family Mobile makes the process really simple. I sometimes go down the rabbit hole and can spend an hour or more just searching for my next great read! The new and included gig of 4G LTE makes the process very fast even when I binge "read" and pick 2 or 3 books to listen to throughout the day. 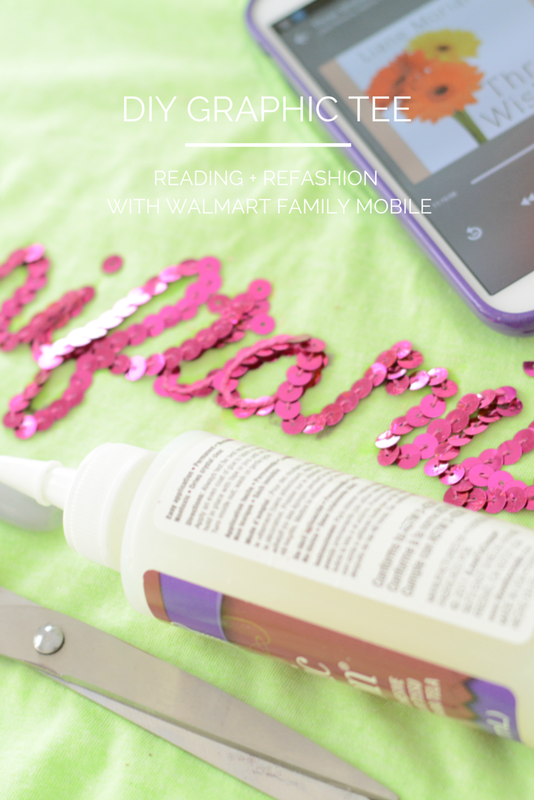 If you're looking for a change to your mobile service, consider Walmart Family Mobile. There's great service, new phones, and lots of downloading waiting for you. Below are a list of phones you can buy that fit every budget. It's the perfect time to make a switch with all of the special spring deals available this month. You can find out more about WFM service and check out more great phones by visiting their website: http://cbi.as/6zxv. How do you use your mobile data throughout the day? The tee turned out great! It's so great that WalMart offers so many options for such affordable pricing. Great post! cute tee! I am so envious that you were able to make it come out legible! Thanks for posting at the Monday Mash Up!